High school graduations are a relatively new feature in Fairfield's 375-year history. As early as 1650, a law required parents "or masters," to provide a fundamental education for their charges, and for towns with 50 or more families to hire a schoolmaster. But Fairfield did not establish a high school in town until 260 years later. The town did build elementary schools -- but sent teenagers to Bridgeport or Westport for high school. The town flirted with the idea of building a high school in Fairfield in 1885, but the voters turned down the proposal. A small step toward providing a high school education for local residents came when the town voted in 1900 to pay the tuition to Bridgeport High School for 20 Fairfield students who passed an examination. By 1914, 78 students from Fairfield attended high school either in Bridgeport or Westport. The first in-town high school project wasn't established until 1914 when the town initiated a high school course, and 46 freshmen began students in the old Sherman School at the corner of Post and Reef roads. The elementary school building, however, was not well equipped for the older students, but the town could not afford to build a new high school, according to Thomas Farnham, author of "Fairfield, the Biography of a Community." Enter Annie B. Jennings. A wealthy philanthropist, she bought a house on Unquowa Road and gave it to the town in 1916 to be used as a high school. That first public high school in Fairfield was built on the donated property, now the site of Tomlinson Middle School. A bigger school building was constructed a short distance away on Unquowa Road, and after housing several grade configurations and renovations over the years, is now the home of Fairfield Ludlowe High School. The building that now houses Fairfield Warde High School, at Meville Avenue and Knapps Highway, was opened in 1956. A contentious debate erupted about 30 years later when the Board of Education cited declining enrollment as a reason to consolidate the town's two high schools into one. What followed was one of the most divisive debates the town ever faced. 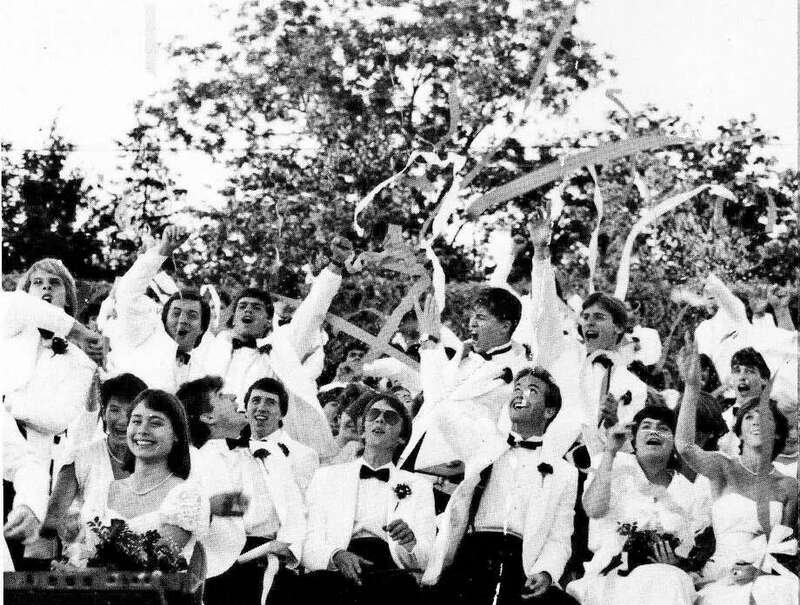 The last graduation of a Roger Ludlowe High School senior class was held on June 23, 1987, where the girls wore formal white dresses and boys sported white dinner jackets that had been its commencement tradition. The consolidated Fairfield High School opened at the Warde building the following fall, and standard academic caps and gowns were the graduates' attire. But having a single public high school serve the town's youth was not destined to continue. After another debate that recalled the acrimony when the earlier consolidation decision was made, growing enrollment prompted the split of Fairfield High School in 2003. The newly named Fairfield Ludlowe High School re-opened in the Unquowa Road building, and the campus that had been Fairfield High School was renamed Fairfield Warde High School. Fairfield became a two-high school town once again, but the Ludlowe tradition of white dresses and dinner jackets for the graduates was not revived. At the 2014 commencement ceremonies next week, the Ludlowe girls will wear white academic caps and gowns, the boys wear blue. At Warde, academic garb for all grads has been black, but this year will feature black academic caps and gowns for Fitts House graduates, white for Townsend House grads and red for those in Pequot House.